The Temple of the Reclining Buddha Bangkok or Wat Pho located on Rattanakosin Island to the south of the Grand Palace, is listed as the highest grade of Royal temples here in Thailand. The temple house the largest collection of Buddha images anywhere in Thailand, including the main attraction the 46 meter long reclining Buddha. A Short History of Wat Pho temple. The temple is one of Thailand’s oldest and even pre-dates Bangkok as the countries capital and is believed to have been at its current location since sometime between 1688 and 1700. However back then it was nowhere near as grand as today. When King Rama I founded the capital of modern Siam in Bangkok in 1782 he ordered the renovation of the site. King Rama I is also responsible for collected any abandoned Buddha images from across Thailand and housing them at the site, making it the largest collection of Buddha images in the country. Over the next quarter of a century the site was extensively enlarged and renovated by successive Kings, and has become not only of Bangkok’s but Thailand’s most significant cultural and religious sites. Wat Poh is considered to be the first public place of education anywhere in Thailand and the is still an important school for traditional Thai medicine. Some regard the temple as the birth place of Thai massage. 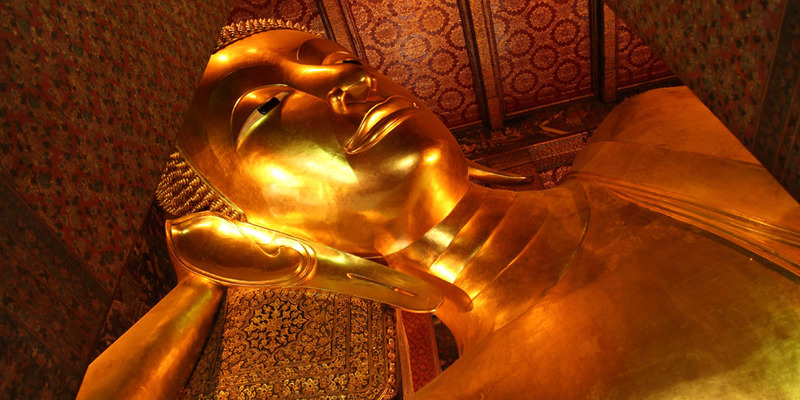 Without doubt the main highlight for visitors to the site is the reclining Buddha itself. Measuring some 46 meters long and 15 meters tall it is an impressive site to behold. The image is covered in gold leaf and mother of pearl illustrations. The image of the reclining Buddha has not been here since the foundation of temple, but was actually added by King Rama III around the 1830’s. The size of this image is truly magnificent and even the feet of the Buddha are 3 meters high and 5 meters long. The Mother of Pearl mosaics inlaid into the Buddha’s feet are arranged in 108 segments each of which depicts one of the 108 characteristics of Buddha. There are also 108 small bowls which line the temple, in which people donate coins to bring good luck, well being and good fortune. The donations also help the monks with the upkeep of the temple. The vast majority of visitors to Wat Pho, mainly those large groups on organised tours only really visit to see the Reclining Buddha, but in fact the site is nearly 20 acres and is definitely worth exploring. The fact that many tourists don’t bother with the rest of the site makes it even better. We would recommend a guide who can show you the rest of the temple and explain things in your native language. This should cost around 400thb. You can of course explore on your own if you wish. We would highly recommend at least seeing the four chapels’ and their 394 gilded Buddha’s, the murals that cover the walkways (this is why you need a guide to help decipher), and the 91 Chedis or Chinese statutes. If you have combined your visit to Wat Pho with a visit to the Grand Palace you will no doubt be a little weary after all the walking, and what better way to alleviate some of your stresses than a traditional Thai Massage. You will not get more traditional than at the temple as this is regarded as the birth place of Thai Massage. As with any religious sites in Thailand and in fact the world, respect is the order of the day. Wat Pho is open daily for visitors for a very modest fee of 100thb from 0800 until 1700, there is no need to book to enter just turn up at your desired time. We would recommend early morning or late afternoon when it is a little quieter and the temperatures a little cooler. If you decide you would like a massage then this is best pre booked when you first arrive to be taken after you have explored.